It was agonizing to watch. Rafael Nadal, long one of the sport's toughest competitors, compromised on the court, his oft-troubled knees letting him down once again. The defending champ and world No. 1 couldn't fight on, retiring from his US Open semifinal against Argentine Juan Martin del Potro trailing, 7-6, 6-2. "I waited as much as I could," he told reporters afterward. "You can imagine it was very difficult for me to say goodbye before the match finished. But at some point, you have to make a decision. It was so difficult for me to keep playing at the same time that way, having too much pain. "That was not a tennis match at the end, no?" he continued. "It was just one player playing, the other one staying on the other side of the court. I hate to retire, but staying one more set out there playing like this would be too much for me." The Spaniard said he had been dealing with right knee pain stemming from his tendinitis since the early rounds. In fact, after his taxing 5-7, 7-5, 7-6, 7-6 third-round win over Russia"s Karen Khachanov, the 32-year-old was asked about his taped right knee. "I try always during the tournaments not to speak much about these kinds of things," he said. "When the tournament is over, it's better and easier to talk." Consecutive wins over Khachanov, Nikoloz Basilashvili, and the for-the-ages decision over Dominic Thiem likely took a toll on the three-time champion, who coming into the semis had spent a tournament-leading 15 hours and 54 minutes on court. "I'm still here. I'm still here because I love what I am doing. I still have a passion for the game. I'm going to keep fighting and working hard." "It"s tough for me, but it's not about losing. It's about not having the chance to fight for it. I feel that I fought all my career against these kinds of things. I missed lot of opportunities. 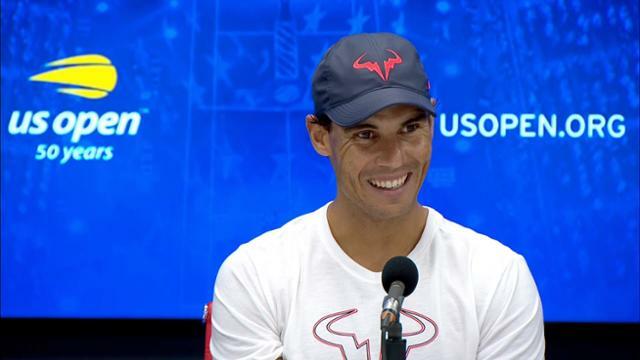 But on the other hand, I won a lot," explained Nadal, who said he can't imagine that the injury will keep him off the court for an extended period of time. "It's tough, these moments, but at the same time, I'm going to keep working hard to have opportunities. I know things are going the right way. I'm playing well. I'm enjoying my time on court. I'm having a lot of success. I'm very competitive at the age of 32. "Lot of people in this room, including myself, never would have thought that, at the age of 32, I would be here fighting for titles, fighting for the first position in the rankings. All my career, everybody said that because of my style, I would have a short career. Nadal's year has hardly been a bust. He's lost just four matches, and has won five titles, including his record 11th at Roland Garros. But two of his losses have come at the Grand Slams via retirement. In January, he couldn't continue his quarterfinal matchup with Croat Marin Cilic (3-6, 6-3, 6-7, 6-2, 2-0 ret.). Is he happy for his longtime ATP rival del Potro? "I can't say that I am happy because I am not. I will not lie to you," he asserted. "But, yes, he's a player that went through lot of issues during his career, like me, too. I know how tough this is. I know how much frustration there can be when you can't do the thing that you want to do. I'm happy for him that he's able to be back in his top level. I wish him all the best. It will be huge if he's able to win a Grand Slam again."